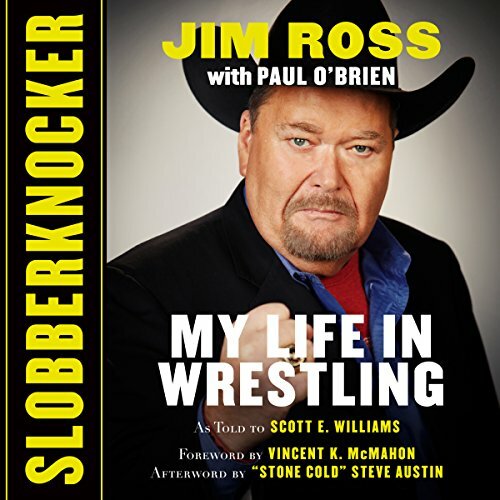 Slobberknocker is the story of how an Oklahoman farm kid with a vivid imagination and seemingly unattainable dreams became "The Voice of Wrestling" to record TV audiences and millions of fans around the world. Jim opens up about his life as an only child on a working farm, who became obsessed with professional wrestling having first seen it on his grandparents' TV. Even though the wrestling business was notoriously secretive and wary of "outsiders", he somehow got a foot in the door to start a historic career, one where he held almost every job in the business - from putting up the ring to calling matches, from driving his blind, drunk boss toward revenge to consoling two naked 600-pound brothers in the shower room after a rough match. With all those adventures and responsibilities, he's also recognized as the man who built and nurtured a once-in-a-generation talent roster that took the WWE to new heights, including "Stone Cold" Steve Austin, Brock Lesnar, and The Rock, to name a few. Listeners will finally get the opportunity to hear never-before-told stories about the politics, wackiness, and personalities of all the biggest stars. But this isn't just a wrestling story. It's a story about overcoming adversity and achieving your dreams, as success did not come without significant costs and unforeseen challenges to JR, including multiple bouts of severe facial paralysis called Bell's palsy. Currently he is the host of the podcast The Ross Report. Any fan of wrestling- from the territory days to today - will be enthralled with stories from the road and behind the scenes. Slobberknocker is the first time Ross tells his story - and you don't want to miss it! ©2017 Jim Ross with Paul O'Brien (P)2017 Novel Audio Inc. Simply a blast from the past. Good ol’ J.R. Has been the voice of my childhood. I have never enjoyed a book as much as I did this one. Even though you will never see this, thank you J.R.
Not only for sharing your story but reminding me to never give up. This is a must for any wrestling fan! Jim is the greatest announcer of all time for sure! I felt the book didn’t really go in depth about the wrestling business. I wanted more stories and behind the scenes stuff. It only covers his career up until WrestleMania 15. To Jim’s credit his career was so long so it would be hard to cover everything. Maybe a second book coming later? Hopefully! I would recommend this book for the wrestling fan who grew up listening and watching Jim. Over all I would give this book a 6 out of 10.
amazing stories. and great insight. you want to know anything about the inside of the business and a great life story and lessons this is a must listen. I truly loved this book. Amazing stories and great details of J.R.'s life in wrestling. loved it. fascinating insight into the wrestling world by one of the best in the industry. Better than it should be. It is awkward listening to JR read his story at first. He is such a natural story teller it feels odd listening to him read as opposed too his free flowing podcast. Excellent stories will carry you through easily and it isn't the worst reading I've heard by far. More inside shop than I thought the company man would go and better than it should be lol. I’m not crying... you’re crying. Great story I need more. A voice of a generation. I absolutely loved this book! I've read and listened to many books about wrestling or about professional wrestlers and this is one of, if not, the best one of them all. Thank you JR! If you want a good telling of a life of perseverance and a genuine gratitude for life itself, this book is it. It was made more compelling being told by good old JR himself. Great book, loved the story, and it's great to hear JR narrate his own life! However, he seems far more comfortable speaking off-the-cuff than he does reading from a transcript. His stories are descriptive and entertaining, but the book's timeline ends in 1999 at Wrestlemania 15! What happened to the 18 years since?? Bah gawd, I smell a sequel! Super interessante und aufschlussreiche Lebens- und Karrieregeschichte über den Meisterkommentator der WWE - gelesen von ihm höchstpersönlich mit einem emotionalen Finale. Hat einfach nur Spaß gemacht, diese ganzen Anekdoten und Zoten zu hören - der Mann hat seinen Job nicht umsonst bekommen, er kann den Zuhörer fesseln und ohne viel Schnörkel die wichtigsten Infos rüberbringen. Er malt schöne Bilder in seinen Geschichten und ich hab oft lauthals gelacht und am Ende auch ordentlich geschluckt. Als gratis Hörbuch des Monats war dies mein interessantester "Kauf" bei Audible. Jim Ross had been one of the most important and most influential man in wrestling history and he tells his amazing journey with a lot if insights and details that should interest every wrestling fan of NWA, WCW and WWF. telling the story by himself adds to the realness of the stories big time. best wrestling audiobook I ever heard. huge recommendation!! Jim Ross ist eine Legende am Kommentatorenpult und deshalb freute es mich, dass er auch selbst Leser seines Buches ist. Die vertraute Stimme zu hören war schon Klasse. Jim Ross erzählt wunderbar und besticht mit einigen interessanten, auch lustigen Anekdoten. Wo er mit Vince McMahon im Auto sitzt, ist mir besonders erheiternd im Hinterkopf geblieben. Dazu schildert er prägende Ereignisse aus seiner Zeit im Wrestling noch einmal aus seiner Sicht, was einem diese Szenen auch nochmal gut wach ruft, sodass man selbst in Erinnerungen schwelgen kann. Ich freue mich schon auf einen möglichen zweiten Teil, denn dieser hier endet mit WM 15. Dennoch eine absolute Kauf Empfehlung!